Don't forget! Right now is the best time to plant your cool season veggies! Check out our selection and get planting! If you want to grow Brussels Sprouts, cabbage, cauliflower and broccoli, be sure to get these in the ground ASAP as they need as much time as possible in the ground to form their crop! As a reminder, for all veggies, we recommend mixing Master Nursery’s Paydirt into your soil. A blend of 45% chicken manure and 55% mushroom compost and redwood sawdust is great for loosening clay soils and improving moisture retention. Don’t forget to feed them too! Fertilize with Master Nursery's Tomato & Vegetable Food 5-10-10 or E.B. Stone Organics Tomato & Vegetable Food 4-5-3 to ensure your best harvest. 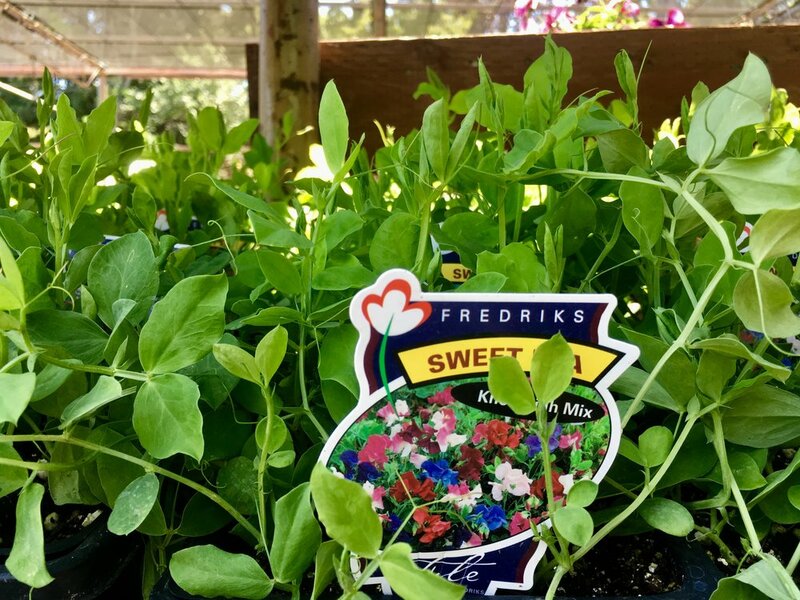 Although not edible, we love sweet peas for their candy-like scent! Sweet peas like sun or light shade; choose a site with rich and moist well-draining soil. A hardy, winter to spring annual vine growing 10’ tall, they are ideal for a temporary screen. Provide a trellis, string or wire and watch as these beautiful climbers create a lush focal point. Colorful, fragrant Sweet Peas make magnificent cut flowers for vases in large, long lasting quantities. Cut flowers at least every other day and remove all seedpods to maximize blooms. 1. English, green, or garden peas are bright green, bulging pods are tough and inedible. The peas need to be shelled. The peas can be very sweet and should be eaten soon after harvest. 2. Sugar snaps are curved, plump deep green pod with tender sweet peas. Everything is edible. Pods are crunchy filled with peas. These can be eaten cooked or raw having a very sweet flavor. Be careful not overcook them. 3. Snow peas are wide and flat green with very small peas. Everything is edible. They are very crunchy with a sweet flavor. Can be eaten raw or cooked. Be careful not to overcook. Cardoons, like their close cousins artichokes, are members of the Thistle family and native to the Mediterranean. Some food scholars believe that the relationship is more than simply close, insisting that the artichoke was born in 15th century Europe as a result of cardoon cultivation. Still relatively unknown in the United States, cardoons look like gigantic, overgrown celery stalks with artichoke tendencies, and tasting almost like a tangy cross between artichokes and celery. While the artichoke plant is prized for its edible flower, the cardoon plant holds its promise of pale, cloudy gray-green stalks. Preferring a damp and mild climate, they are grown as a food crop in Italy, France, Spain, Australia, and Northern California, among other places, and primarily as ornamentals in England. Very cold weather is said to make the stalks tender. A hardy herbaceous perennial growing 4 feet high and 5 feet wide, cardoons are great for a border or accent with handsome spiny foliage and purple thistle-like flowers in summer. Plant in sun with well-draining soil and water regularly. Be sure to feed once in fall and again in spring for healthy growth. Spinach is a wonderfully versatile vegetable, popular worldwide, with nearly every cuisine featuring spinach somewhere in its repertoire. The Italians are particularly partial to spinach and have hundreds of dishes using this vegetable. The words à la Florentine mean the dish contain spinach. Spinach requires rich, fast draining, soil. Give plants plenty of water and 1 feeding to encourage lush, full foliage. 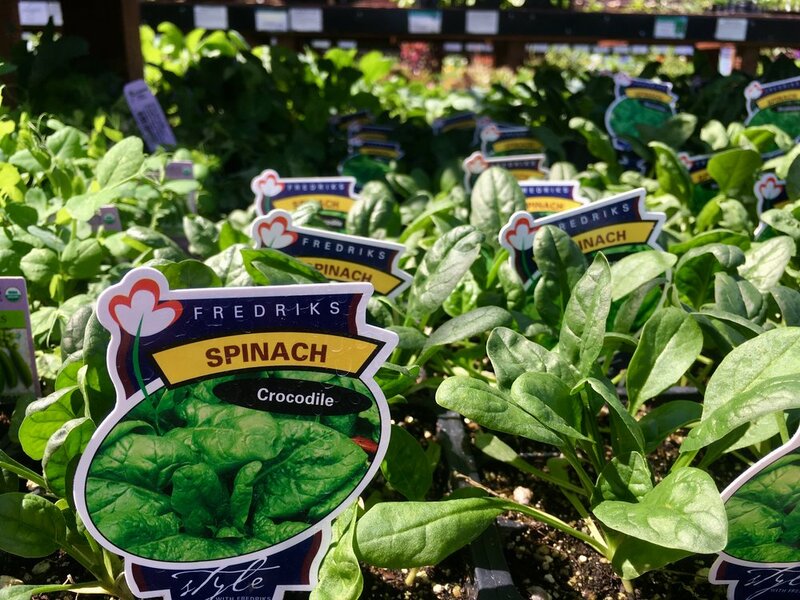 Popeye's addiction to this "power-packed" vegetable comes from the fact that it's a rich source of iron as well as vitamin A and C.
A perennial, make sure you prepare your soil well. (Be sure to pick up a few bags of Master Nursery’s Paydirt to work into your existing soil!) Growing up to 4 feet tall with a spread of 6 feet in diameter, allow plenty of space for them to grow. Keep your ‘chokes heavily watered, about once a week during their growing season. Any moisture deficiency will result in loose buds. Collard greens are very popular in the American South, where most of the American crop is grown. Plant in full sun with ample and deep watering. We recommend fertilizing before heads begin to form. Upon harvest, remove the oval leaves from the stalk before cooking. It is important to cook collards for a length of time or the leaves can be chewy. A good source of vitamin C and K, the flavor can be mild and a little bit stronger than cabbage. Missed Part 1: Cool Season Veggies? Read up and learn what winter veggies you don't want to be missing!